Firstly, a big thank you to those who took the time to participate in this small project, in which I am trying to establish the ‘true’ popularity of each Premier League team. For the uninitiated, more details are available in an earlier post. Each respondent was asked to rank the Premier League teams by preference, from their favourite team to their least favourite team. Historically, Manchester United have dominated these kind of polls, but whether due to the small sample (234 replies) or type of Twitter followers I have, Arsenal won 23.5% of the first preference votes in this example. Typically Arsenal would be described as the ‘league’s most popular team’, but this doesn’t account for second, third, fourth preference votes. 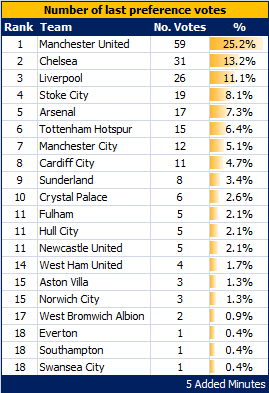 The reality is that over three-quarters of people didn’t pick Arsenal as their favourite team. That said, Arsenal are a popular pick as a ‘second club’. 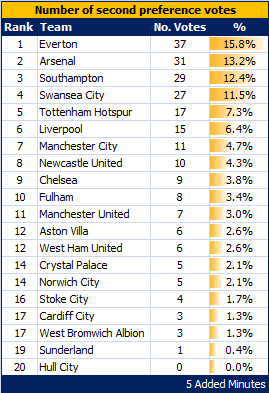 Everton have the most second-preference votes, whilst Southampton and Swansea also prove popular second teams. A final summary table looks at the last preference votes – that is, the club supporters most dislike. Perhaps unsurprisingly, Manchester United ‘top’ this table, with a quarter of respondents voting the 20-times league champions as their least favourite team. 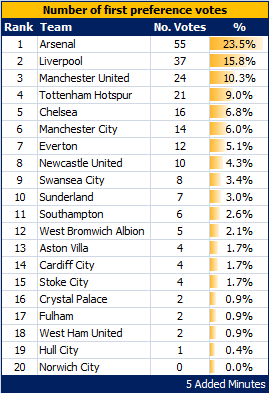 Posts over the coming days will attempt to establish the most popular Premier League team using this data. Given the small number of respondents (and an oversight whereby I did not ask if the respondent was primarily a fan of a Premier League team) the results will largely by theoretical rather than practical – highlighting the dangers of assessing only first preference votes rather than definitively choosing a ‘winner’. Alternative Vote: where teams are eliminated based on the quantity of first preference votes, before transferring second, third, fourth etc preference votes to determine a winner with more than 50% of the vote. Coombs’ Method: where teams are eliminated based on the quantity of last preference votes, before transferring second, third, fourth etc preference votes to determine a winner with more than 50% of the vote. Borda Count: where teams are awarded points according to the number of first, second, third etc preference votes – similar to the system used in the Eurovision Song Contest. Curiously, all these methods produce different winners – watch this space. Finally – the survey remains open, so if you have not given the exercise a go, please do.